Collective Soul has now gone past their reputation as a radio-friendly, post-grunge rockers. They've taken their level of musicianship to a higher plane, where fans have remained loyal, while others now revere them as rock demigods or music heroes. Collective Soul's founder is lead vocalist Ed Roland; who literally 'collected' musicians / band members in order to form a band. These recruits have come and gone, with Collective Soul surviving with radical member changes over the years, until finally settling down with the current line-up that we know of today. Prior to their major label signing to Atlantic Records, "Shine" had the initial makings of a monster hit when GEORGIA MUSIC SHOW at Georgia State University, included a demo of "Shine" on their playlist rotation. Being the largest student-run radio station in the county, "Shine" was an instant hit! Soon enough, it reached other radio stations, the record label…and the rest of it is its shining double-platinum history. With a hit single and a 2x platinum album, plus touring spots with Aerosmith and 1994's Woodstock, Collective Soul was raring and ready to take on the world. From there, bigger hits followed with the release of their three-time platinum self-titled follow-up album. "Shine" was one of grunge-era's defining anthems. "December," "The World I Know", ‘Breathe’, ‘Wasting Time’, ‘Gel’ and "Where The River Flows" were all US chart-topping songs. As a testament to their significant contribution to rock music, Collective Soul was inducted into the Georgia Music Hall of Fame in September 2009. 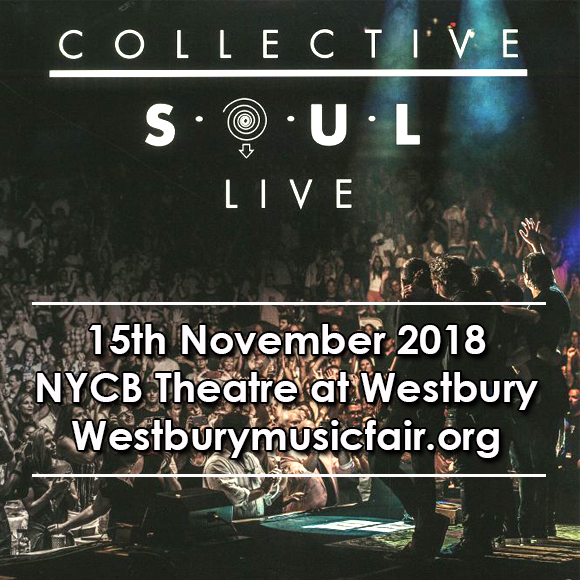 Collective Soul is a band and a concert you cannot simply ignore. Their songs take you back to a momentous era and seeing them perform live would move you forward to the present time to this experience that music is at its finest when heard and seen live. Get your tickets, be there, and capture this instagrammable moment!